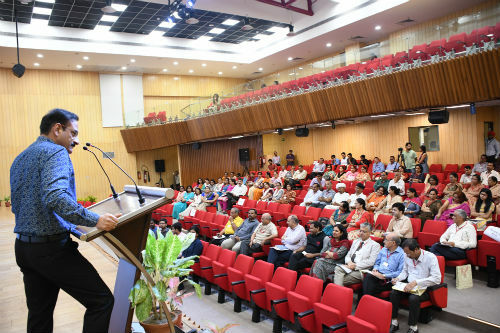 Sonepat : Ashoka University, a Liberal Arts and Sciences University, in collaboration with the Government of Haryana, successfully hosted day-one of an academic conference titled Making Haryana as an Education Powerhouse. The two-day long Conference being held at the Ashoka University campus at Sonepat, on the 15th and 16th of September 2017, aims to foster the symbiotic relationship between the State of Haryana and the higher education sector. Day one of the conference was attended by Shri Rajesh Khullar, ACS and Principal Secretary of Chief Minister of Haryana; Pratap Bhanu Mehta, Vice Chancellor, Ashoka University; Vineet Gupta, Founder and Trustee, Ashoka University; Narendra Jadhav, MP, Rajya Sabha and Distinguished Professor, Council for Social Development among other eminent academicians, policy-makers, government officials and representatives from the Ministry of Education. The State of Haryana has emerged as key education hub over the last few years and currently houses 1 Central University, 6 Deemed Universities, 15 State Universities and 20 private universities. This Conference will help strengthen the education ecosystem in the region, help identify areas of growth, open up possibilities for collaboration with world-class international universities as well as facilitate a dialogue on the key issues faced by the Higher Education sector in India today such as need for increased partnership between public and private universities, expanding access to higher education in the State as well as social and infrastructural development. Over the course of the conference, key issues relating to the present state of educational initiatives, sustainable training & development opportunities and technological advancements were discussed by the panelists. Day-Two of the conference will take the discussion further with a focus on key disruptions in the Higher Education sector and will discuss key elements that have contributed to the evolution of the sector in recent times such as the rise of digital education, increase of access and cutting-edge academic research.